Which Should You Buy - Whole Wheat or Regular Pasta? My son has one food that he talks about incessantly. You guess it, KALE! Actually, no, it isn't kale - it is macaroni and cheese. The child of this healthy food writer would rather eat macaroni and cheese than any other food on earth. His mother has tried to find ways to enhance the below recipe (that Alex loves) to get some more nutrients in him. He has managed to pick out any vegetable I have added and complained about changes to his food love. What to do? Well, how about whole wheat pasta? I had dismissed whole wheat pasta as a terrible idea until I spoke with an Italian chef. He said that what really mattered was what you put on the pasta - not the pasta itself. He insisted that imported Italian pasta was the best. Italian pasta is regulated by law (seriously) and must contain 100% durum semolina flour and water. Durum wheat has a very high protein content versus other strains of wheat. If you choose Italian pasta versus American pasta - you are getting something that probably tastes better and is a bit better for you. Now, you can find whole wheat durum semolina pasta from Italy on the supermarket shelves. 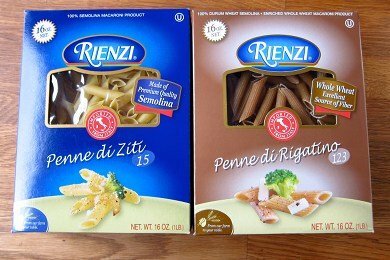 The brand I featured above, Rienzi, was in my local supermarket and has 100% WHOLE WHEAT durum semolina flour. As you can see, you get more protein and fiber for the same amount of calories with the whole wheat version. How does it taste? I found that I didn't notice a difference after I put a sauce on it. Initially, when I tasted it out of colander, I thought it was going to be terrible. But, just as my Italian chef said, you don't notice the flavor of the pasta after you add the other stuff. And, mysteriously, I ate less of it than the regular pasta. Could it be that the extra 3 grams of fiber filled me up and I felt fuller sooner? I think so! Below, I have included Alex's favorite macaroni and cheese recipe. This is NOT one for losing weight, but it is a great one for parents who don't have time to make a cheese sauce and then a casserole. The garlic gives it a wee little kick. Heat oven to 350F and spray large casserole with non-stick spray. Cook pasta about 3 minutes short of al dente and drain. In a large bowl, mix 3 cups cheddar, eggs, milk, garlic, and salt. Add pasta, mix, and add to casserole. Top pasta with the last cup cheddar and bake until golden and bubbling about 25 minutes. Enjoy! McDonald's Smoothie vs. Odwalla Smoothie: Which Should You Choose? We only buy whole wheat pasta these days. It might only be 50% sometimes, but it's still got more body and flavor than the regular stuff. I find now when I go to restaurants and get pasta, it is flat and tasteless compared to what I make at home, even if the sauce is good. The same thing is true of bread. You get used to the difference after a while, and you miss the whole wheat when it's not there. Its true.. the stats on whole wheat are great. However, sometimes with a lighter sauce whole wheat can be too dense, so what we do is mix it with half regular and you cant even notice! Homemade mac & cheese is rediculously easy! Have you tried using pureed squash as the base for the cheese sauce? My daughter, father and SO haven't noticed the change yet, but I can't let them watch me make it. :) There's a great recipe for it on food network's website somewhere. Like Courtney above I use some pumpkin puree (it makes the mac and cheese look more like that powdered packaged stuff in the blue box), and I also add creamed cauliflower to the sauce. My family thought I'd added more cheese! We have eaten ONLY whole wheat pasta for about 6 years now. My 5 year old has never had regular pasta or white rice. She saw white rice for the first time this year at a family members home and thought there was something wrong with it! LOL...same with pasta, saw it at a restaurant and wouldn't touch it. Kids eat the good stuff when that's all they know!! By the way, my 5 and 2 year old LOVED your Acorn squash recipe!! Good stuff!! Thanks for all you do Lisa! Good info and great comments. I'll give them a try! I'd like to know Snack Girl's thoughts on Ronzoni Smart Taste. It's white pasta enriched with fiber. It's been my go to because I don't like the texture of wheat pasta. Wondering where it ranks nutrition wise? Thanks! I find that wheat pasta is stiffer or firmer or something. I can't get past the texture in my mouth. I don't mind the flavor so much, since mentally I'm a fan of the health improvement more than I hate the flavor. But the texture just bugs me. And what about Spaghetti Squash? It's a decent pasta swap. Great article. I don't think many understand the benefit of whole wheat pasta and it has the stigma that it just doesn't taste as good and like you said that isn't necessarily the case. You should really try a 100% Whole Grain pasta, too. It has 5 grams of fibers and 6 grams of protein per serving. I find the flavor to be delicious and very much like traditional semolina pasta. While it is true that Italian pasta 100% durum semolina, so are all of the major brands in the US. Plus, major brands are made on Italian presses, just as it is in Italy. The product is not different when talking just straight pasta in a package. (Boxed pasta that comes with sauce or powders is different.) So, it's not any better for you just because it was made in Italy. I don't like the texture of whole wheat pasta. It's more crumbly. I buy high fiber non-whole-wheat pasta instead (which still has around 7 grams of protein per serving and around triple the fiber of whole wheat) and find it much more palatable as well as less carb-y for the diabetic in my family. Love Whole Wheat Pasta. One question is why in comes in only certain shapes, penne, shells, linquine or thin spaghetti? Does it cost more to make all the shapes and sizes of white pasta? This is a question I know only Snack Girl can answer. As a college student, I always try to buy whole grain type pastas, not because I like it better (because I don't), but I like to force myself to eat a little bit healthier to offset all the bad things I eat late at night and while I study. Make sure to get 100% whole wheat or whole grain pasta over pasta that uses wheat flour. Wheat flour is not 100% whole wheat but both wheat and white flour mixed together, which isn't giving you many of the nutrients that the 100% will. I usally buy Barilla plus with omega3's multigrain pasta it has 4-9 grams of fiber a serving depending which noodle type you get. @ Leah Grode - Sorry, I'm just catching up reading old posts but wanted to respond if you see this... Ronzoni Smart Taste does has fiber and other nutrients added but they are artificial nutrients. Your body doesn't know what to do with artificial nutrients; therefore, it can't and doesnt' use them. Additionally, the sugar from the white pasta slows down the aborption of any nutrients anyway (if there were any real nutrients). The company puts that on their box to sell the product. What about the Barilla Plus with omega 3's? Semolina, grain and legume flour blend, [grains and legumes (lentils, chickpeas, flaxseed, spelt, barley, oats), egg whites, oat fiber], durum flour, niacin, iron (ferrous sulfate), thiamine mononitrate, riboflavin, folic acid. Contains wheat and egg ingredients. Semolina by definition is durum wheat with the bran & germ (most of the nutrients) removed. So 100% semolina is NOT whole grain. 100% whole grain durum flour would be. I love whole wheat pasta. I have never tried this brand but I will. I like the dense texture.